Facebook - a pernicious company which profits from spreading hate, lies and confusion? 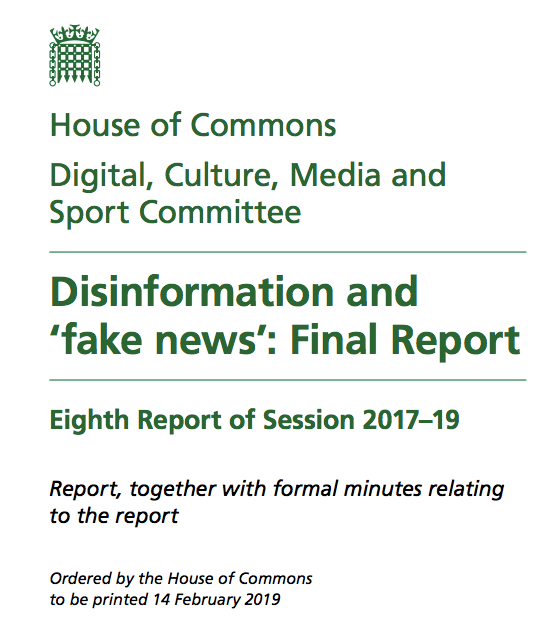 The digital, culture, media and sport committee today published its findings into disinformation and fake news, and it is absolutely scathing about the harms that Facebook is doing to individuals, society, and the political process. TBH I’m not sure if the report was only meant to focus on Facebook, but this particular company is most definitely the main focus, and there is literally nothing good to be said about the company. The investigation took 18 months and it covers all sorts of scandals Facebook has been involved in, such as Cambridge Analytica. I’ve never seen anything like it TBH! Allowing fake news to be posted which influences elections and democratic process and polarises public opinion. Effectively allowing foreign governments to manipulate the outcome of elections. In a nutshell, the report concludes that Facebook profits from allowing malicious forces to spread hate, lies and uncertainty. What’s also interesting is how damning the report is of Facebook’s contempt of the international committee which was established to investigate it…. Mark Zuckerberg refused to appear in front of them three times, while posting on his Facebook page that he was happy to co-operate with them. Instead the company sent lesser representatives who the committee believe were picked deliberately because they were unable to answer certain questions put of them, and it speaks of a ‘contemptuous’ attitude which the Facebook top-tier has towards government, essentially believing itself to be above regulation. The report even says the company’s structured opaquely to avoid proper investigation. The company speaks a good game, always saying how it is happy to co-operate and how it is engaging in ‘voluntary regulation’, but in practice it really seeks to carry on with business as usual. How valid is this report? The report doesn’t exactly come across as neutral… it really is damning of Facebook. Whether this is because the company annoyed the committee by obscuring its investigation I don’t know. However, it’s well known that Facebook has been involved in all sorts of scandals, and so maybe this utter condemnation of this company is the result of a dispassionate analysis – it’s quite possible given that there were several people involved in the committee from 8 countries besides Britain….maybe the final write up really is just an objective reflection of what Facebook is – a pernicious force which profits from spreading lies, hate and confusion. How to reign it in? That’s a question I’ll come back to at a later date! I haven’t read the report, only your post. And I agree with the assessment of Fakebook. It’s also all the investors!! And more importantly, it’s all the users. Everyone knows exactly what Fakebookhas been doing now. And yet a massive number of people still remain active users. They can only be considers to be complicit. There is no excuse anymore. Thanks for sharing this. It’s important. It really is quite daming! I think raising awareness and encouraging less use of the platform is at least a small defensive process! Even more important for viable alternatives... like Steem for example. I’m looking forward to a project called Junto which is going to be on the Holochain. And there will be more.... this is only a good thing. Junto.. I'll have to look that up cheers! It looks very interesting. Very different to Steem. There's no precedent for these massive online companies and the law is still finding ways to control what they do. They are bigger (financially) than many counties with enormous power of influence. I'm sure some were started with good intentions as well as an eye on profit, but it's easy to lose control. I'm sure they have to employ huge teams to monitor what is going on and they will be working on ways to automate that. The next few years will be very interesting. In some ways we're in the same position now as with big media barons a century ago. Digital literacy is gonna be crucial! There's some similarity, but these companies reach far more people and can react much quicker. That's scary power to have. Well not ATM.... there's not enough eyes on it yet to make it worth people's while! You just got a 1.39% upvote from SteemPlus! Your UA account score is currently 4.541 which ranks you at #1908 across all Steem accounts. In our last Algorithmic Curation Round, consisting of 201 contributions, your post is ranked at #28.